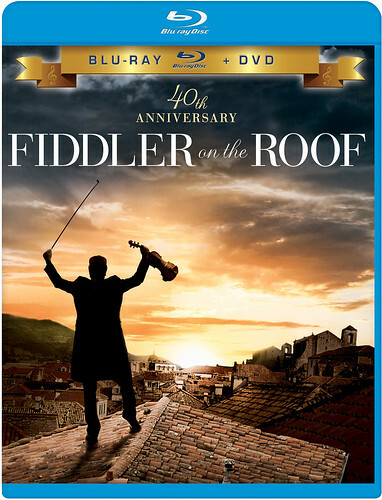 Norman Jewison's Fiddler on the Roof has been released on Blu-ray in time for its 40th anniversary. The winner of three Academy Awards was adapted from the 1964 musical of the same name, which won nine Tonys and was based on Tevye and His Daughters by Sholem Aleichem. The story is set in 1905 in the small town of Anatevka, Russia, comprised of an Orthodox Jewish community and an Orthodox Christian community, all living under the rule of the Czar. Tevye (Topol) serves as the narrator and main character. He is a poor Jewish milkman with five daughters, three of which are the main focus of the plot. He reveals his people are like the metaphorical fiddler on the roof who tires "to scratch out a pleasant simple tune without breaking his neck." He gives an example of what makes his community so strong in the opening number "Tradition," which becomes slightly ironic as the world he knows is constantly changing, from the growing independence in his daughters to the outside forces that endanger his people. His eldest daughter Tzeitel (Rosalind Harris) rejects Yente (Molly Picon) the matchmaker's arrangement with the elderly butcher Lazar Wolf (Paul Mann). She instead wants to marry the young tailor Motel (Leonard Frey) who she has grown up with and loves. Tevye is angry because of their break with tradition and his having already agreed to Lazar's proposal, but he can't deny his daughter's happiness so comes up with a scheme to get his wife Golde (Norma Crane) to agree to the change. Perchik (Michael Glaser) is a student from Kiev Tevye meets in town. Tevye finds his ideas interesting and offers him room and board in exchange for teaching his daughters. He and Hodel (Michèle Marsh) fall in love and as he prepares to leave town and take part in the revolution, they tell Tevye, who is angered that they have broken tradition by arranging their own marriage also. He refuses but they tell him they don't ask his permission just his blessing. Chava (Neva Small) asks permission to marry Fyedka (Raymond Lovelock), a Christian young man. Marrying outside the faith is too much and Tevye refuses to tolerate it. When they elope, he considers Chava dead to him and the family. As Tevye deals with his family's internal strife as his daughter rebel against tradition, his fellow Jews struggle against the growing animosity directed towards his people. A pogrom takes place the night of Tzeitel and Motel's wedding, and then they are all order to leave town with three days notice, scattering them to parts of Europe and America. Although set in a Jewish community, the story could take place amongst any people as children turn away from the tradtions of their parents. The film offers a very good blend of humor and drama as the conflicts grow more serious with Topol's performance being the lynchpin that helps hold it together. It's heartwarming to see Tevye give in to his first two daughters wishes, but unfortunate he has no ephipany that his rage towards Chava marrying outside the faith is similar to the hatred that spurs the anti-Semetism his people experience, which is heartbreaking to watch as they have no alternative but to take it. The Blu-ray goes right into the movie and doesn't have a typical menu, which makes accessing extras more work than they need to be. The video is given a 1080p/MPEG-4 AVC encoded transfer displayed at 2.35:1 and looks good for the film's age. Color is strong, including the desaturated dream sequence, and blacks are rich. A natural film grain can be seen and so can some occasional dirt and marks from the print. The source has an intended softness but it doesn't diminish the detail and textures. The audio has been given a remastered 7.1 DTS Master Audio track, which the music makes the best use out of as the John Williams-led orchestra fills the surrounds. Ambiance effects are well positioned, and the dialogue is clear and understandable, even with the accents, coming out the front. Unfortunately, the ADR work sounds very bad, flat and lifeless, and there's a lot of it as they mouthed the lyrics on the set to music played back. It doesn't sync well either, which contributes to shattering the illusion. The Bonus Features are plentiful. In separate sessions, Jewison and Topol offer commentary edited together. The National Film Board of Canada finds "Norman Jewison Filmmaker" (50 min, SD) on location in Yugoslavia four months into production and looks at the making of the film. It was very interesting to see him direct on the set and talk about his background and working in the Hollywood system. "Norman Jewison Looks Back" (9 min, SD) is broken into smaller segments. "On Directing" he talks about getting this job. "Strongest Memory" finds him touching on multiple choices. The "Biggest Challenge" was the weather. "On Casting" he discusses why he went with Topol over Zero Mostel, who played the role of Teyve on Broadway. Jewison weighs in on whether the film is "A Classic?" Jewison introduces "'Tevye's Dream' in Full Color" (7 min, SD), which shows the scene in color before it was desaturated and then in a side-by-side comparison. "John Williams: Creating a Musical Tradition" (12 min, SD) finds Williams and others talking about his work on the film, which earned him his first Oscar. "Songs of Fiddler on the Roof" (15 min, SD) is a great piece as the trio writer Joseph Stein, lyricist Sheldon Harnick, and composer Jerry Bock, who created the musical, discuss its creation. "Deleted Song: 'Any Day Now'" (3 min, SD) is a demo of the song by Perchik that was never filmed accompanied by film clips and stills. "Tevye's Daughters" (16 min, SD) played by Rosalind Harris; understudy to Bette Midler's Tzeite on Broadway; Michele Marsh; and Neva Small talk about being cast and making the movie. "Set in Reality: Production Design" (10 min, SD) focuses on Robert Boyle, who gets a nice tribute as he talks about his work on the film. A "Storyboard to Film Comparison" (21 min, SD) is done with five different sequences, showing the talents of some very talented artists. It's too bad they were identified. There are "Trailers, Teasers and TV Spots' and a DVD copy of the film. Jewison and his team did a very good job transporting the musical Fiddler on the Roof into the film medium with the choices made in areas such as set design and editing. Having great source material helps as does finding people who can bring it to life. The Blu-ray has a pleasing look and good audio, though the latter is limited by the source's ADR work.